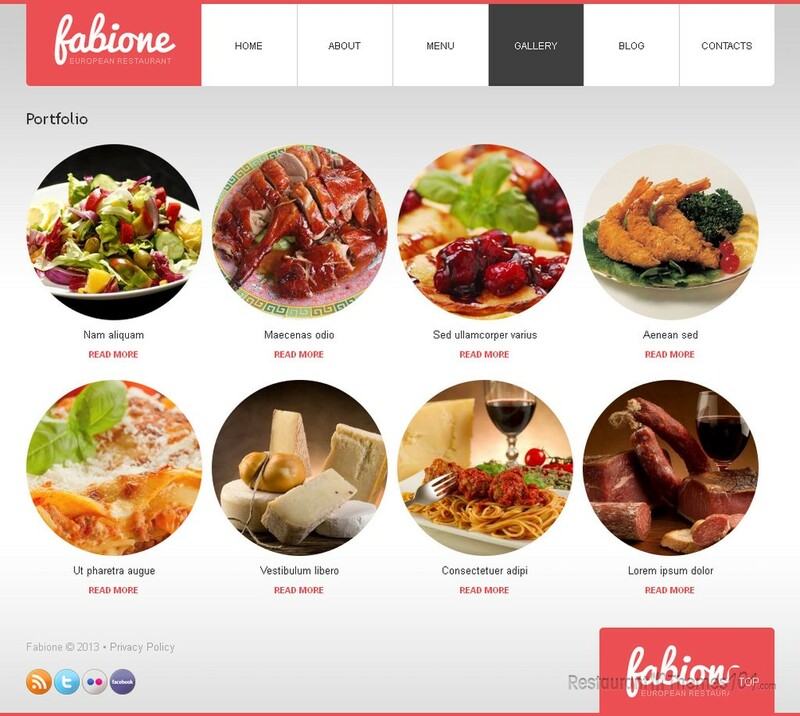 Fabione is a nice looking Drupal restaurant theme created by Cowboy. 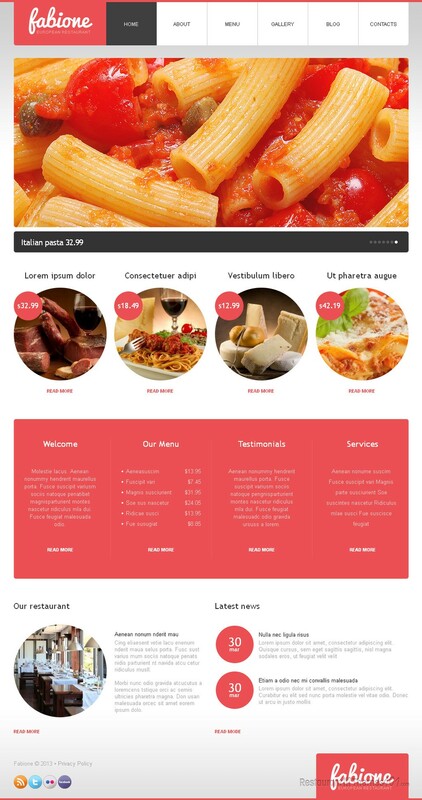 This theme is featured at Template Monster and it offers many useful options, and can be used for various restaurant niches. 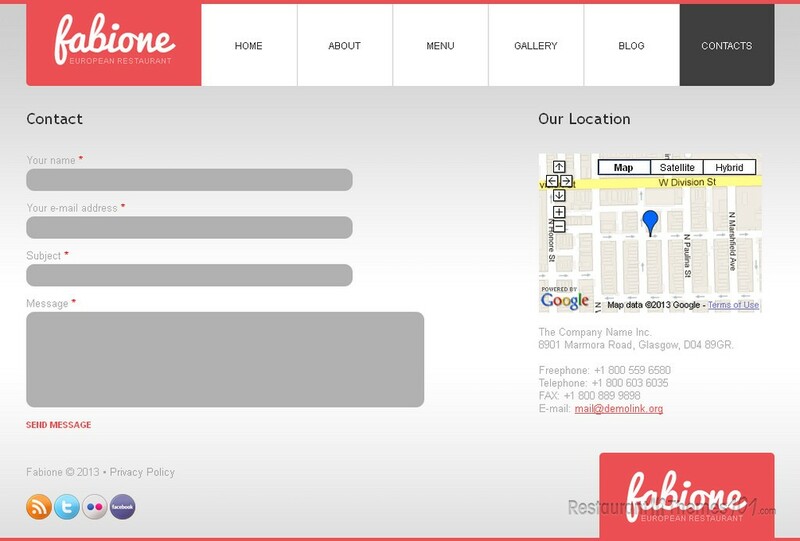 Fabione features a professional, compact layout with a great choice of colors and options. The homepage features a big slider for showing off with quality photos of your mouthwatering delicacies and lets you glue your visitor’s eyes to the most important thing, which is the great food you offer. The theme lets you feature many content posts to your homepage and interest your visitors in your featured offerings right away. 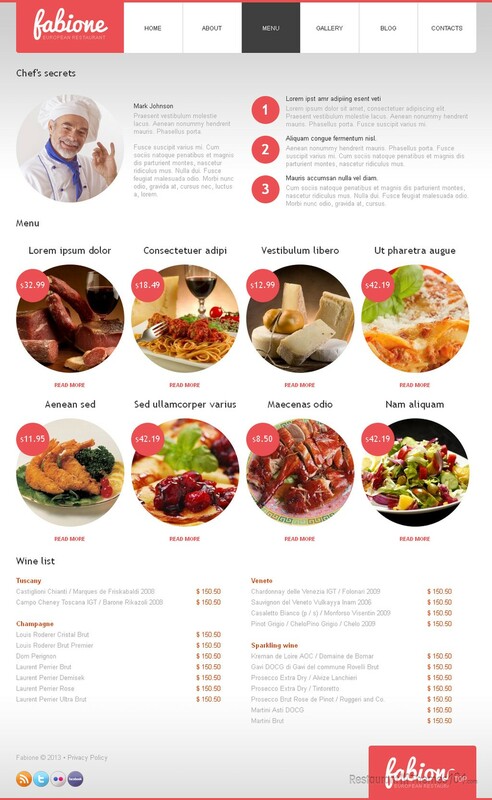 You will be able to present your popular meals or your daily specials with nice resized photos and prices attached and a clickable “read more” link that will take them directly to a page where you can tell them all about your special offer and the delicious dish that caught their attention. 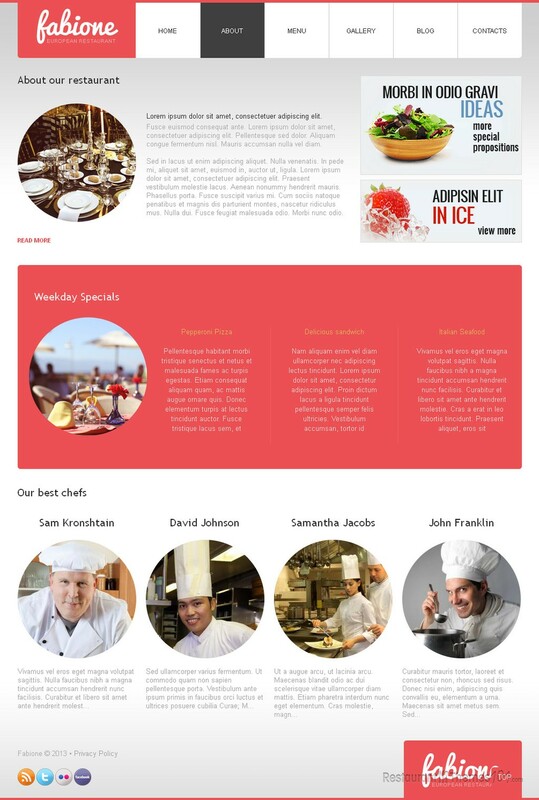 Furthermore, the menu itself looks great and it is very easy to create it. The blog section allows you to post as much as you want, about anything you want to, and you will be able to feature these posts on the homepage. Adding welcoming note will show your visitors what a great host you are and what a nice, cozy atmosphere they can expect at your restaurant. What will interest them even more are the testimonials of your existing customers, the ones that have already had the pleasure of dining at your place. A nice phrase from a happy customer says a lot about a restaurant, and you will be able to place such testimonials on your website for everyone to see. 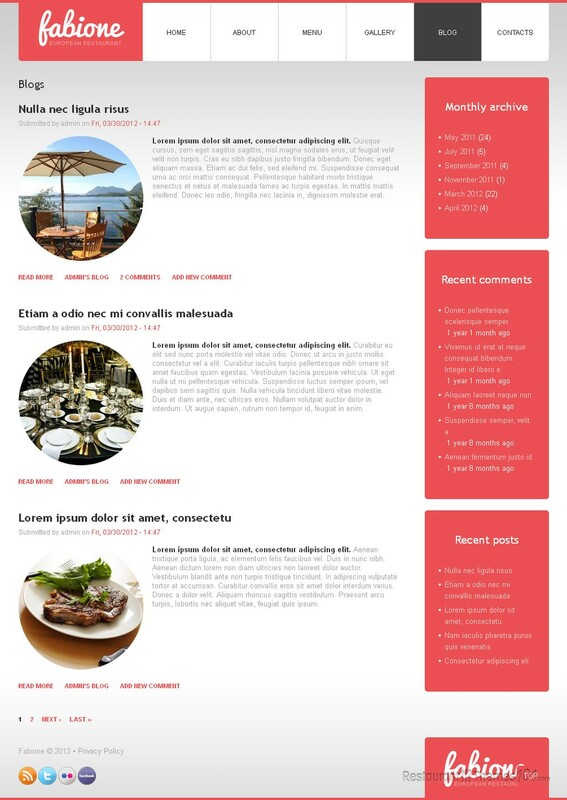 Not every restaurant theme for Drupal offers the possibility of adding exact directions to your restaurants on your website, but Fabione certainly does with the help of Google Maps integration. There is also a nice contact form added for easier interacting with your customers, and let’s not forget to mention the great social integration this theme features, allowing you to connect your website to the most popular social networks and share your content worldwide.